Ally McCoist is a Trustee of our charity East Kilbride Community Trust who are building a Community Stadium in East Kilbride which is going to have a Boxing Gym and Multi-use hall as part of the facility. The Boxing Club and Sunday Club (which is an additional special needs football club for youngsters) both train at the same hall in Jackton and will be integral sections of the sporting hub at the Community Stadium. Ally McCoist met with the other trustees, David Hepburn of Select Fitness, Jackton Boxing coaches Eddie McMullen, Neilly McCallum and Joe Finnegan to discuss the detail and design of the proposed facility which both clubs will be using. 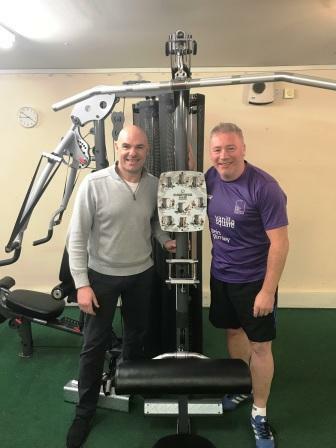 David also donated a multidiscipline weights machine to the Trust, that helps improve the condition and builds up weak muscles. Ally McCoist, said “I love being a part of the Trust. The guys, Monique and I want people to get the best chance to succeed in life. The Trust strives to create opportunities to inspire our youngsters, which in turn will create a legacy for East Kilbride and its people. 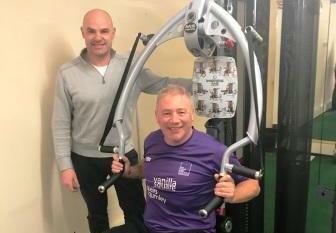 Monique McAdams, Chief Executive Officer, East Kilbride Community Trust said “David’s generosity is greatly appreciated by everyone at the Trust, as this expensive piece of equipment will be well used by our inspiring boxers and our budding footballers. I know Vincent Keane, Jackton Boxing Club President, would also like to thank David for taking the time to share his expertise which will help the East Kilbride sporting community”.